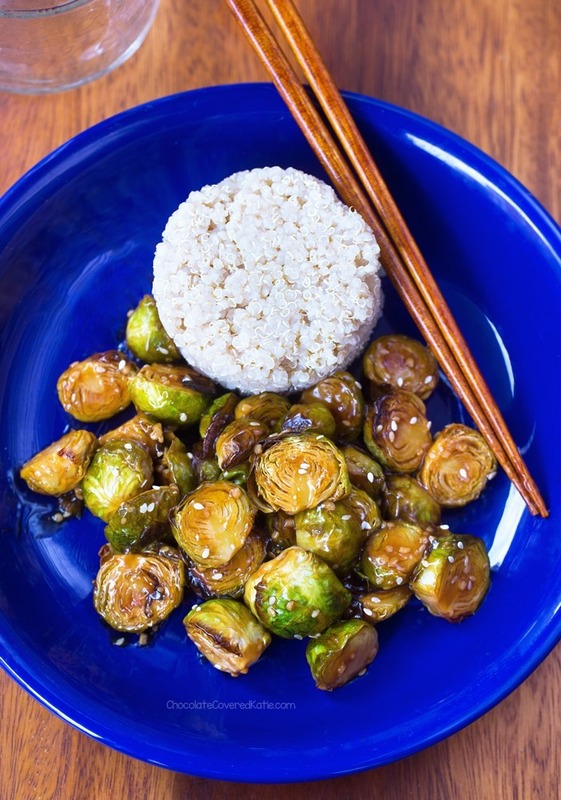 Home » Sticky Sesame Brussels Sprouts! Brussels sprouts really can be addictive. More Healthy Recipes: Over 120 Plant-Based Healthy Dinner Recipes. Actually, I’ve always liked brussels sprouts. When we were growing up, my mom called them “baby cabbages,” which for some reason made me think they were super cute. Plus I wanted to be a rebel, so as soon as I heard kids were supposed to hate the little green vegetables, it automatically made me love them even more. I’m not sure where the whole kids-hate-brussels-sprouts thing originated anyway, or if there’s any truth to it. 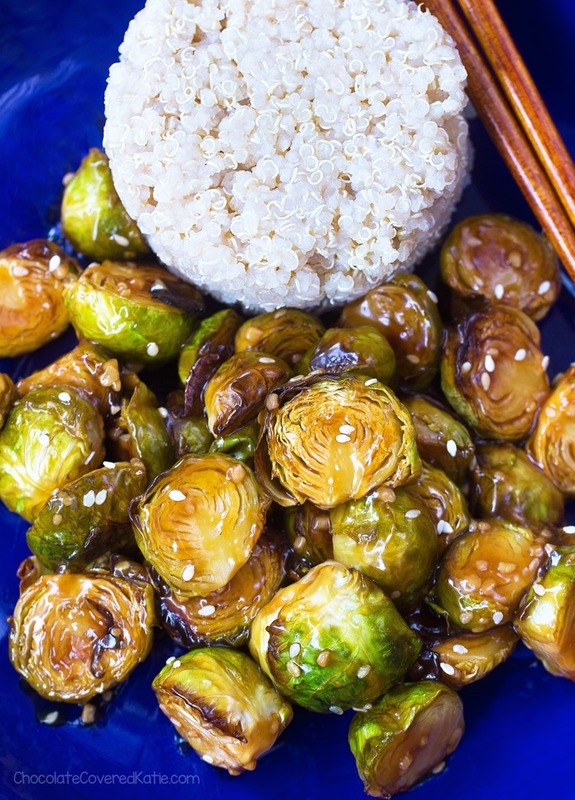 Pretty much every single person I know loves brussels sprouts! And when they’re roasted in the oven and tossed with sticky-sweet sesame sauce, they are especially easy to love. 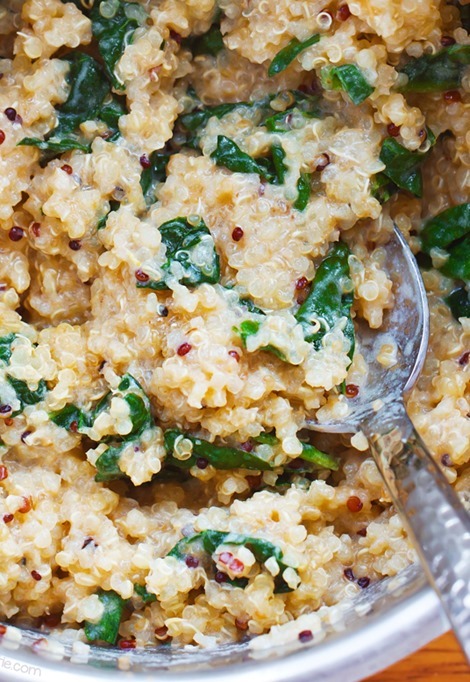 I served mine with quinoa (see How To Cook Quinoa – The Easy Way) instead of rice. Still being rebellious over here. 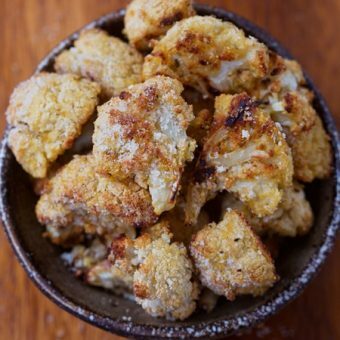 We tried both the regular and soy-free versions of the recipe and loved both, so feel free to go with whichever you prefer. 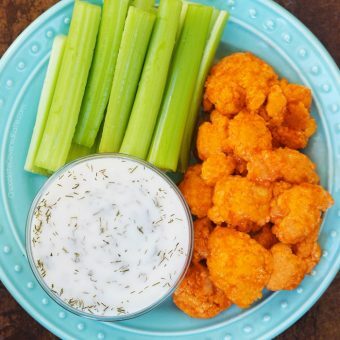 The small amount of oil (just 1 1/2 tsp for the entire recipe) adds such a huge flavor boost that I recommend including it even if you’re on a mostly oil-free diet – it doesn’t add up to much per serving and makes a big difference in taste. Be sure to look for toasted sesame oil, which has a stronger sesame flavor. I usually buy mine at Trader Joe’s. Preheat oven to 450 F. Grease one or two baking pans, or line with parchment. 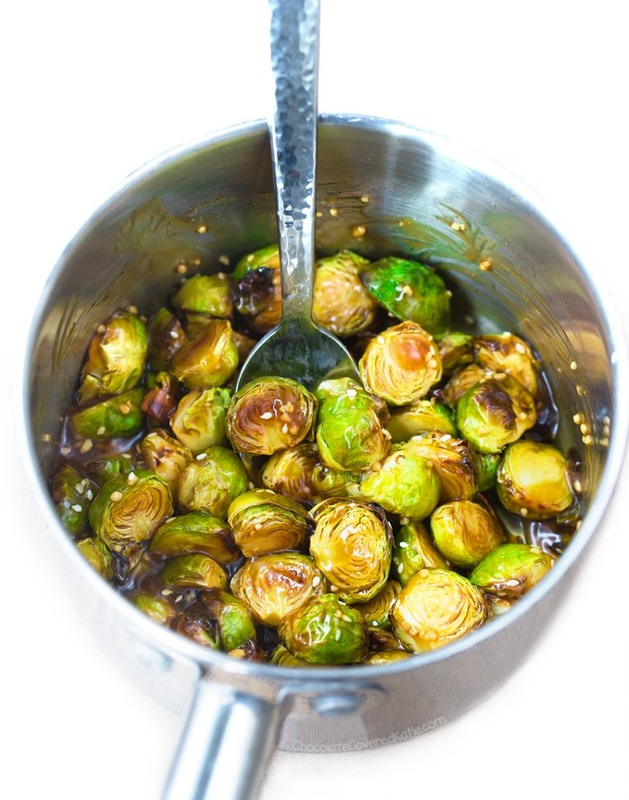 Arrange Brussels sprouts in a single layer in the greased pan. Bake 20 minutes on the center rack. Meanwhile, whisk together the soy sauce, sweetener, vinegar, garlic, sesame oil, and ginger in a saucepan. Bring to a boil. While waiting, stir together the cornstarch and water until cornstarch dissolves fully. Whisk this into the saucepan as soon as it boils. Turn heat to medium and cook–stirring–until it begins to thicken. Flip sprouts and bake 20 additional minutes or until desired texture is reached. Mix sauce with sprouts. Sprinkle sesame seeds on top if you wish. I think the main reason kids don’t like things is because of the name. Think about it: Brussels Sprouts? Asparagus? Mushrooms? Who wants to eat that? I remember when I was little I thought I wouldn’t like Brussels sprouts because they didn’t sound good. Then I tried them and loved them. Even celery with peanut butter and raisins doesn’t sound great (to a kid), but if you call it Ants on a Log, kids will gobble it up. My two kids love Brussels sprouts (and all veggies)! People are so surprised when they hear that. I always either sauté or roast them, and never serve them boiled. That’s another thing- when I hear adults say they don’t like vegetables, I ask how they’ve had said veggie cooked. Usually they’re just boiled, and that takes away all the yummy flavor! I always tell them to try cooking it differently. So true! Boiled brussels sprouts are the worst! These look amazing! 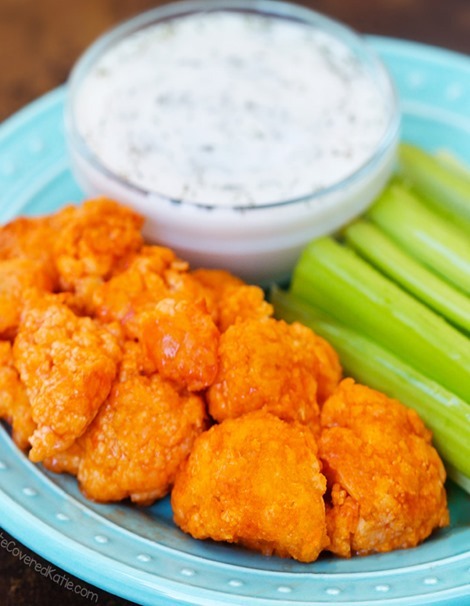 Totally making these for lunch today! I can’t wait to make these. They sound so easy and delicious. I can’t wait to try this tonight! I love how filling brussel sprouts are 🙂 I might add a tiny bit of sriracha to the sauce for an extra kick! 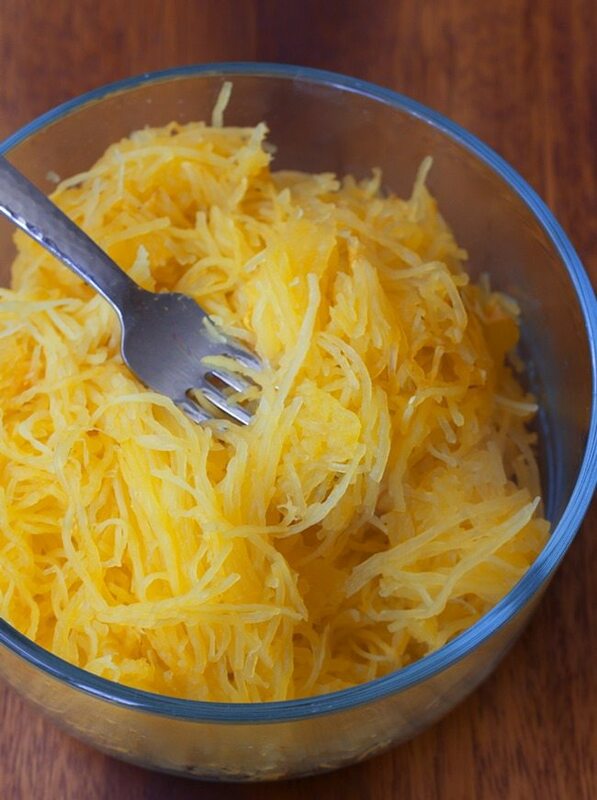 I imagine this would be good with vegan yum yum sauce too! Sriracha is good on everything xD the more the merrier, ha! These look delicious. Would they keep well for leftovers? 8 cups is a bit much for the two of us. Or would it work better to do the math to halve the recipe? Thank you! Hi, I think it’s probably less than 8 cups anyway, but you can definitely freeze brussels sprouts! Because they’re not a waterlogged veggie like mushrooms or zucchini, they freeze pretty darn well, especially if they’ve been roasted! I came here to ask the same thing! But my partner won’t eat them, so 8 cups for one person sounds ridiculous lol. But this looks like a wonderful recipe, so I want to know the quantities for 1 serve, or 2, to reheat a second serve for lunch the next day. My mom forwarded this to me today — oh wow. I love Brussels sprouts in any and all forms from hash to broiled, and this delectable recipe is going on my list. I only wish my local co-op still had the ones on the stalks! Brussels sprouts? Addictive? YOU HAVE NO IDEA. The most Brussels sprouts I’ve ever eaten was probably at least three pounds, and I could probably have still been able to eat more! I definitely will try the sesame marinade sauce and use it for other veggies too. 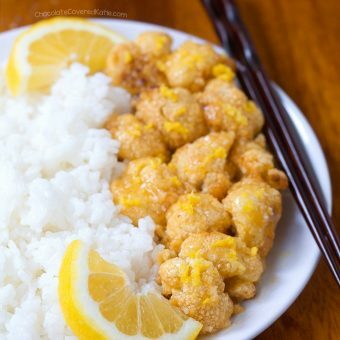 Sticky sesame cauliflower, sweet potatoes, pumpkin, eggplant, broccoli, and carrots sound great too! Super yummy!! Will be making this for my vegan boys. And I’ll be eating a lot myself!! It turned out great. Didn’t have to bake the brussel sprouts as long. This looks delicious! I was definitely in the hate brussel sprouts camp when I was a kid, but I think I had only ever had them steamed or boiled and super plain. When I tried them again as an adult (roasted with garlic and sea salt), it was love. They’ve been one of my favorite vegetables ever since. I made these for dinner this week, using small Brussels sprouts from a farmer’s market. After 20 minutes, the Brussels sprouts were well done and starting to burn in spots. The cooking instructions worked perfectly for the sauce (which was delicious), but I think the recipe needs to be updated to specify that cooking time for the Brussels sprouts may vary depending on the size of the sprouts. I imagine that large Brussels sprouts would require the full 40 minutes cooking time. 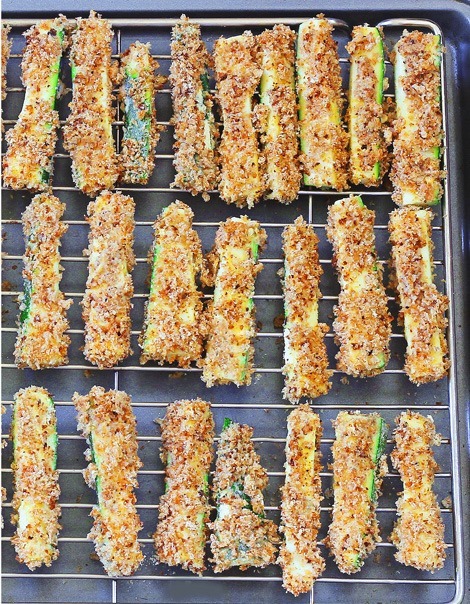 I made these last week and they are so yummy! I was wondering if 8 cups was too much for one person but not a chance! I placed the rest in the fridge and kept going back to have one- they are addictive. Took the rest for work the next day and were even more delicious! I too did not bake them for as long as they were getting pretty burnt. Oh so fabulous! 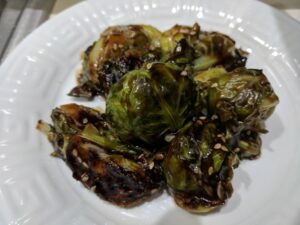 I roasted brussels sprouts with some cauliflower florets in the air fryer and then tossed with the yummy sauce. 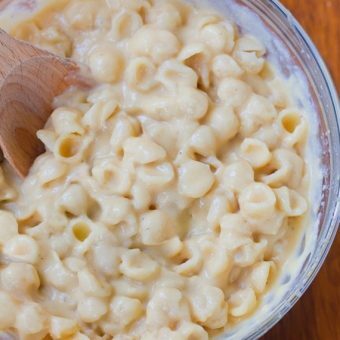 Quick, easy, and oh so tasty!!! Ok, I’ve made this recipe at least three times and I absolutely love it. It’s so easy to make and it tastes delicious. Definitely my favorite way to eat brussel sprouts now! !